Io Interactive has had a rough couple of years. But with a renewed focus, the team has rallied together their best efforts, and the simply-titled Hitman is the result. With a new, episodic release schedule and pricing scheme, it looks like the franchise is being taken in somewhat uncharted territory. Is this a strategy that will work? Read on to find out. The goal in Hitman is simple — you’re tasked with taking out one or more targets, in whatever way you see fit. You play as Agent 47, a ruthless man raised as a killing machine. Before beginning your mission, you can select which two pieces of equipment you’re going to start with. This can vary from a lethal injection, to remote explosives, and wire to strangle with. You’ll quickly learn which pieces of equipment work best for you – my favorite combo was the wire and remote explosives. Things rarely go to plan, and they certainly didn’t in this instance, either. I was able to place the remote explosives just fine. I walked across the street, and into a nearby building. There was a port worker, whom I knocked out and took his outfit from, placing his body in a nearby bathroom. Since the bathroom was a good distance away from where I had placed the explosives, I detonated them right then and there. I heard a loud bang, and a few people scream. I casually made my way out of the bathroom, and saw panicked security guards…carrying the body of the man I just killed inside the yacht! After waiting a few minutes for the scene to die down, I was able to walk into the crew deck of the yacht — I was still in disguise, and no one had seen me near the explosion, so I still had that working for me. Next, I worked my way down a few hallways, where I found a security outfit. After taking down the lone security guard in this area of the yacht, I was free to explore a little bit. In short order I found the man that I had killed earlier, and was able to take his suit. It fit like a glove! The rest of this mission was then a breeze: walk onto the yacht, up to the target’s level, walk with him into his private office, execute, and flee the scene before any of the partygoers even knew anything was wrong. 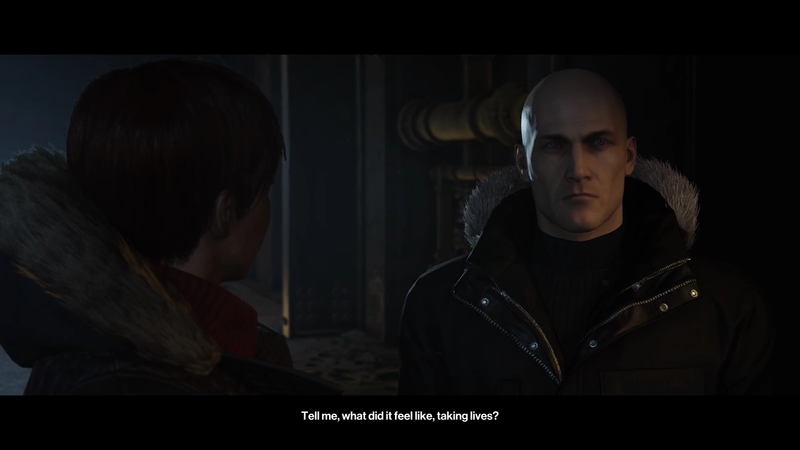 Part of what surprised me at first when playing Hitman was how the game actually responded to your actions in ways that made clearing an objective more of a challenge. In other games, if NPCs see a dead body, they will freak out, scan the area, and then return to their normal patrols after a while — even if their patrol goes right over that dead body. Here, however, the NPCs at least perform some cleanup, and then initiate patrols. If anyone sees you commit a crime, you become “Hunted,” and the enemy will perform larger sweeps in an effort to find you. Any disguise that you were wearing at the time you were spotted will be marked as Compromised, and you’ll have to find a new one if you want to continue to move freely about the area. Presentation is fairly top-notch, with dozens of characters appearing within tight corridors, and no pop-in to speak of. Coupled with a consistently high frame rate (with the exception of bringing up the pause screen/menu), this is the best-looking Hitman to date. Oh, and the handful or so cutscenes are gorgeous. Instinct mode, where holding R1 slows down time and highlights people and interactive objects around you, is very useful. However, if you venture into an area where NPCs will attack you, you only have a brief moment to leave the area before your cover is blown. This will result in many restarts, which is a shame. Kicking in Instinct mode right away, with a prompt to let you know that you’re entering a restricted area, would’ve been a nice option to have instead. In this installment, you can save the game as frequently as you like, and at any time. When you fail an objective, mission, or are killed, you can reload a savegame that you created, or one of the many saves that the game creates for you automatically. This is a great system, and really encourages you to experiment with the game — mistakes are not nearly as painful because you only lose a few minutes’ worth at a time. Load times are fairly lengthy, but when you consider that saves include the game in the exact same state as when it was saved, the net result is quite a lot of time saved for you, the player. Beyond the single-player options, there are leaderboards, but more excitingly, a contract creator mode. With this mode, you play through either the training missions or the single scenario released thus far, Paris. You can tag any NPC, to mark them for death. Once you’ve decided on your target(s), you can kill them in whatever way you see fit. The game will remember exactly how you killed your marks — what weapon or tool was used, what outfit Agent 47 was in, etc. After completing the objective or clearing the mission, you are then shown a summary of which targets you killed, and how. You can then set up the custom contract’s name, description, and terms for killing each target. Publish, and wait to see who can match your prowess. It’s a fun diversion as we await future episodes of Hitman. While it’s true that right now there is only one main scenario, there are enough options and events that unfold that you will be quite busy attempting to perform each objective in this one location when the next episode releases. Io Interactive has taken a different approach to Hitman‘s release schedule, and if each mission is as fleshed out as what we’ve seen in Paris, then there is much for fans to be happy about. There’s so many ways to take on this single mission, part of the fun will be seeing other players’ creative ways that they assassinate the targets. If you’ve ever wanted to play the part of a super agent in a large sandbox, this is as good as it gets. With a fairly robust content creation engine, and future missions promised throughout the coming year, it looks like Hitman will be the weapon of choice of stealth gamers for the foreseeable future. Hitman review code provided by publisher. For more information on scoring please see our Review Policy here.